The main objective for most horse owners is to ensure their equines are comfortable, mobile and able to perform to the best of their ability. Stretching exercises can help achieve this as stretching has been shown to increase flexibility, suppleness and reduce muscular pain and tension. 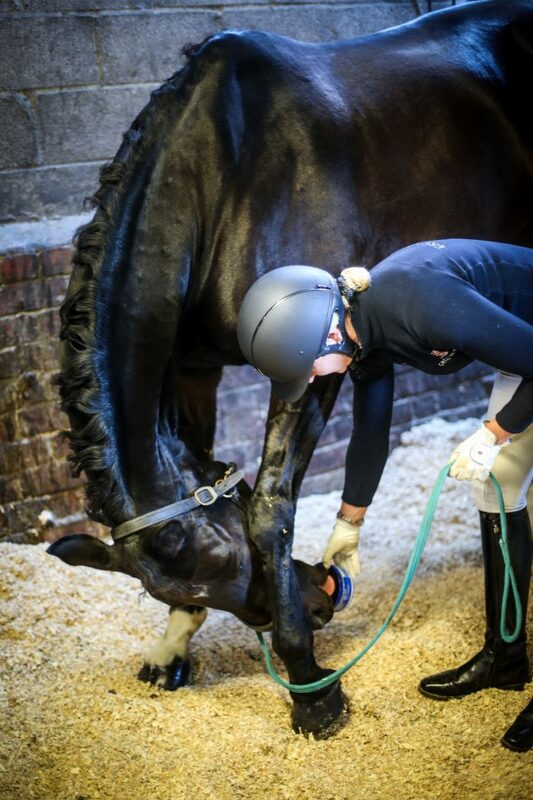 Mini Horslyx provides an excellent way to complete stretches with your horse or pony as the small easy to handle tub allows you to hold each stretch for the optimum time needed, and unlike treats or carrots which can be snatched or broken off, Mini Horslyx provides a sustainable reward. Mini Horslyx stretching exercises allow horse owners to support their horses in maintaining healthy, mobile musculature. Recent studies have found that stretching routines with our equines can enhance performance and improve your horse’s co-ordination and body awareness. This can not only help your horse feel more comfortable in his own skin but may aid his balance and agility whilst under saddle. Mini Horslyx provides the perfect healthy and sustainable medium for encouraging your horse to stretch. The palatable formula provides a dense composition which is designed to be “licked” not chewed so encourages your horse to work for his reward providing a durable source to hold each stretch for several seconds. In addition Mini Horslyx is packed full of nutrients to benefit your equine. Just like regular Horslyx, Mini Horslyx is a 100% natural product which contains vitamins, minerals, trace elements, oils and hoof supplements Biotin, Methionine and Zinc. Begin by standing in front of your horse holding the Mini Horslyx at sternum level and gradually encourage him to stretch out his neck towards you without stepping forwards. Aim to keep a relaxed top line which will help support correct back posture. The key thing to look out for is whether the thoracic sling, abdominal muscles and back are engaged as these will help with core strength development. Some horses will step forwards to reach the Mini Horslyx rather than effective stretching so enrol the assistance of a friend, or try performing the stretch over a stable door, chain or rope placed at sternum height. Make sure you keep your horse’s head and neck as straight as possible when completing this exercise. Stretch lifts and flexes the withers, neck and back and can be compared to us doing a sit up! The exercise helps to enhance core stability and encourage strong muscles across the topline and in the abdominal area. To complete this stretch use the Mini Horslyx to gradually encourage him to lower his head down creating an arc shape with his neck and holding the stretch for 5-10 seconds between his front legs at fetlock level. Some horses may “cheat” and simply step back, so try positioning your horse close to a wall to discourage him from moving. 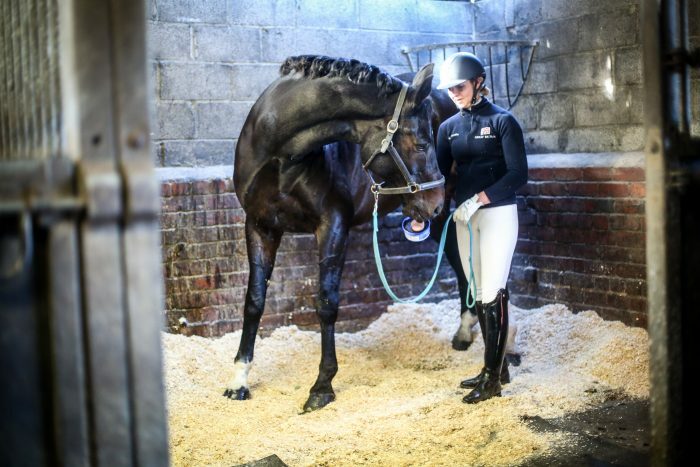 Don’t worry if your horse bends one of his front legs – this is due to a lack of flexibility in ligaments and tendons and is very common, just like those of us that cannot touch our toes as a result of tight hamstrings! As long as the abdominal muscles contract and the back lifts this exercise will still provide a good stretch. The stretch to either side acts to lift and flex the spine laterally, flexing the base of the neck and helping to increase abdominal strength and flexibility through the back. This exercise is particularly useful for improving suppleness through the base of the neck and back and improving the ability to bend. It provides one of the best “whole body stretches” possible with equines! To complete this exercise stand with your back in contact against your horse’s side and hold the Mini Horslyx in the hand closest to your horse’s tail, allowing your horse to bend his neck to meet the Mini Horslyx and encouraging him to bring his head across your body. Begin at around girth level but gradually lower the Mini Horslyx to create a stretch and bend through the neck, back and through the rib cage. As your horse becomes more accustomed to completing this exercise you can increase the stretch by standing closer to the stifle in order to create a deeper stretch through the neck, back and withers. Always repeat the exercise to both sides to promote equal flexibility and body control. All stretching routines should be built into your horse’s routine slowly; hold each stretch for approximately 5-10 seconds and build up to completing each exercise three times. Always complete equal stretches to both left and right. Remember never to put pressure on the headcollar or leadrope or force your horse to complete a stretch and allow him to stretch within his comfort zone. It is recommended that you complete your stretch routine after your horse has been exercised in order to avoid stretching cold muscles, which have low blood saturation and by not being “warmed up” are more at risk of injury. To watch these stretching exercises in action please check out our video on YouTube by clicking here. Disclaimer: These exercises are designed to be used as a tool to encourage suppleness in injury-free equines. If you are in any doubt as to the benefit to your individual horse then please seek advice from your vet or therapist. Horslyx does not take any responsibility for inappropriate use, or injury sustained through the use of these exercises.